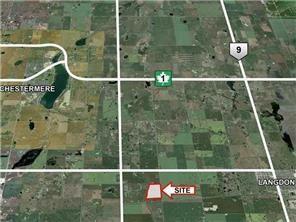 +/- 100.05 acres of ranch and farm zoned land in a fantastic location with great access and proximity to Langdon, Chestemere, Glenmore Trail and Hwy 22X. Wonderful Future development potential as the property is adjacent to R2 zoned land and is mainly flat and level. 2 wells on site generating $6150 income / year.